This will be an evening featuring virtuoso acoustic guitar performance joining forces with singing, saxophone and piano. 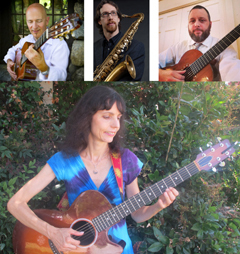 International Fingerstyle Guitar Champions Helen Avakian and Mark Sganga, internationally performing saxophonist Christopher Brellochs and guitarist extraordinaire Dan Stevens will share the stage, with everyone getting a chance to play all together, in smaller groups and solo. These artists are well versed in popular, classical, jazz and musical theater styles, so expect a concert filled with variety from originals to soulful Carole King songs, Ralph Towner-esque jazz, Brazilian, Celtic and Americana styles. The performers also are longtime music educators in area colleges with a commitment to passing on their skills and knowledge to the next generation of musicians.